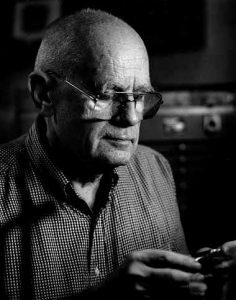 John Paul Miller, the revered Cleveland Institute of Art professor, 2005 recipient of SNAG’s Lifetime Achievement Award, and one of America’s greatest goldsmiths, passed away last weekend at the age of 94. Miller designed exquisitely crafted brooches, pendants and rings. 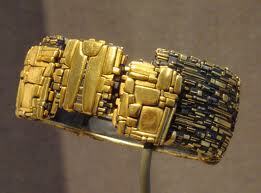 His work has been compared to those of Rene Lalique and Louis Comfort Tiffany. Miller’s body of work was also collected by notables including the late New York art dealer Lawrence Fleischman and the late Sherman Lee, a former director of the Cleveland Museum of Art. Miller was born in Huntingdon, PA, in April 1918. 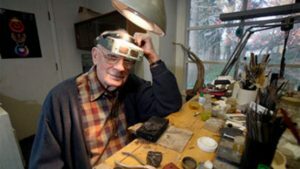 He spent most of his career at the Cleveland Institute of Art while producing custom jewelry for clients of Potter & Mellen, a renowned Cleveland jewelry store. He is well remembered by friends, students, and collectors for his gentleness and modesty, along with his artistic skills. Miller’s work includes spiders, crabs, and other creatures that crawl or fly, along with jewelry inspired by geological formations. His work is said to have achieved such recognition, in part, due to his ability to draw inspiration from the natural world, including from his many hiking trips in the Rocky Mountains and Tetons. He is also recognized for his skill in design and technical perfection. While less known, Miller also produced work including films, photographs and paintings. 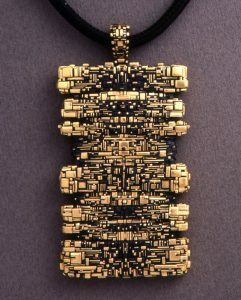 Miller is remembered with admiration in the goldsmithing community for his revival of an ancient Egyptian technique called granulation, in which tiny beads of gold are fused to an underlying gold surface to create a glittering, stippled, effect. Miller has been called “one of the great jewelers and metalsmiths of the century,” by Cleveland Art Institute President, Grafton Nunes. Nunes also recognized Miller as “one of the giants” at the Institute due to his excellence in teaching and his long-time role as director of the exhibition gallery. Nunes also commented that Miller “is going to be very sorely missed,” by students and faculty alike. A memorial celebration will be scheduled at the Cleveland Institute of Art. View a video produced by Jeff Mancinetti of Miller discussing his work and his career. View a Cleveland Arts prize video about Miller.